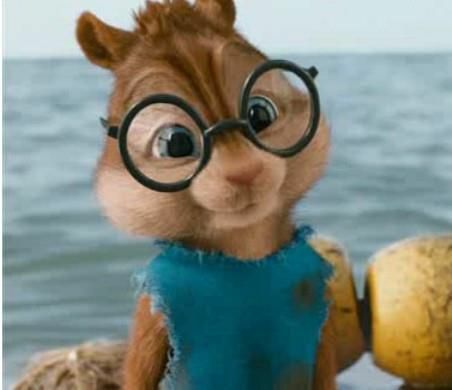 Does Simon of ‘Alvin & The Chipmunks’ have Asperger Syndrome? And now, for a really important topic— The Chipmunks. Specifically, does Chipmunk brother Simon show signs of Asperger Syndrome. It does seem that Simon is the Chipmunk with the worst social skills. In the second movie, he wouldn’t hug ‘Aunt Jackie’ because he wasn’t a hugging kind of guy. Later he never became one of the school jocks even though he showed that he had skills by throwing an apple core into the waste basket from a good distance, besting one of the jocks. Simon was twice pictured at tables with chess pieces but never really developed a circle of friends like Alvin did at school. Simon was also very awkward with Jeanette, his Chipette counterpart. It wasn’t until the third movie when Simon was bit by a venomous spider and transformed into the heroic ‘Simone’ that he was able, in that other persona, to express his affection for Jeanette. In the original descriptions of Asperger Syndrome children affected by the disorder were called ‘little professors.’ Doesn’t that describe Simon? He always has some intellectually advanced information to impart. And he doesn’t have the social skills to dumb it down when his only audience is Alvin and Theodore. Simon relates well to the adult in his life, Dave Seville, and can have adult conversations with him. I don’t know if this is a common Asperger trait, but I know in my childhood I related better to adults than other kids. So perhaps this is also evidence. I know some people think it’s futile to make these amateur diagnoses of Asperger Syndrome in famous people, and perhaps it’s even more so when we are talking about a famous chipmunk whose also part of a hit singing group. But still, my conclusion about Simon Seville (yeah, that’s his last name) is that he is One Of Us.